Hello Kitty Slays as Wonder Woman! The new Wonder Woman movie is out so expect all kinds of cute, and, well, wonderful Wonder Woman merchandise to show up capitalizing on the success of the movie. Now I am a huge fan of Wonder Woman since the days when it was a comic book. I just loved that her only weapon was a “lasso of truth” and that she slayed the men with her beauty instead of weapons of destruction. I even called my Mother “Wonder Woman” because she was beautiful and knew how to wrap men around her finger with her charm and wit. Then the TV series with Lynda Carter came along and was also a huge hit and a fave of mine. I mean come on, how can anyone not be blown away by the beauty of Lynda Carter? But Gal Gadot has reinvented the iconic super heroine and it is a blockbuster success too! So now in comes one of my fave little icons to join forces with her: Hello Kitty. 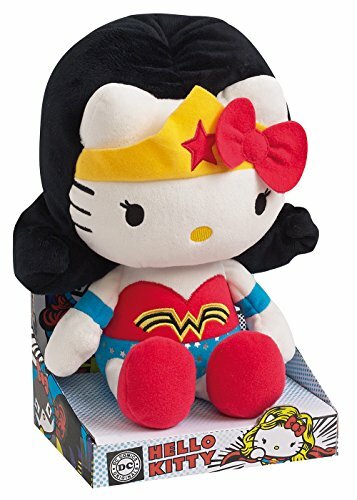 This morning I saw this story on a blog and ran over to Amazon to see if there are any Hello Kitty Wonder Woman items yet, and yes, there are. You can see the blog here. The image featured above is from Sanrio’s own site and can be found here. Sanrio is the creator of Hello Kitty. You can see that the manufacturers are already banking on the idea that this particular merchandise is set to become collectible and pricing it accordingly. I think it will too, so I am very tempted to buy it despite the high ticket price! Add a cute Hello Kitty Wonder Woman sticker to your laptop or car to show your captivation! Pretty sure there will be more Hello Kitty Wonder Woman stuff coming soon, so check back to see it! Meanwhile, don’t miss the movie! 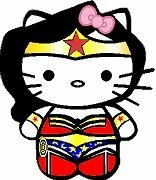 And consider a Hello Kitty Wonder Woman Halloween Costume this year! So cute! 1 Hello Kitty Slays as Wonder Woman!